Battery power is a baffling topic to most boaters, but is also critical for starting engines and running lights and accessories. If you don’t happen to have an abundance of “smarts” when it comes to managing your charging needs, it helps to have a system with the “smarts” built-in. Fortunately, modern “smart” charging options are available to make proper care of batteries almost goof-proof. We have onboard battery chargers, portable battery chargers and combination inverter/battery chargers for any size or style of boat. To find out more about chargers that are combined with a power inverter, see our West Advisor, Do-it-Yourself: Selecting an Inverter or Inverter/Charger. 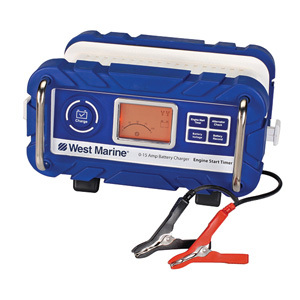 Marine deep-cycle batteries last the longest and charge the fastest if they are charged in distinct phases, which we refer to as the “Ideal Charge Curve,” the charging schedule recommended by virtually all makers of marine batteries. In the description that follows, remember that recommending precise voltages for batteries is subject to at least two caveats: 1) gel batteries charge at different (and lower) voltages than flooded-type and AGM batteries; 2) The voltages stated are temperature-dependent. This makes it difficult to recommend precise charging voltages, since they vary according to the temperature of the battery. Most of us generally operate our boats in temperatures between 50°F and 90°F, and the values used in our West Advisors reflect that. Higher temperatures require lower voltages, and lower temperatures require higher voltages. Note: In the following section, we define the capacity of the battery bank (in amp-hours) as C.
Bulk phase: This is where the heavy lifting takes place. Charge at a rate up to 20 percent to 40 percent of the batteries capacity in amp hours to a voltage of about 14.6 volts (gel: 14.1 volts). For example, a 200 amp-hour battery would be charged at 40–80 amperes. This will bring the battery to about 75 percent of full charge, and is efficient (more amp-hours replaced per hour of charge time) since the battery accepts more current when it is discharged. AGMs require slightly different voltages, and unless there is an AGM setting, should be charged using lead-acid settings. Acceptance phase: Maintains battery at 14.6 volts (Gel: 14.1 volts) while the amperage is steadily reduced. This will restores the next 25 percent of capacity at a declining rate. Your battery can be considered fully charged if it will accept current equal to 2 percent of C at 14.6 volts (a 200 amp-hour battery will only accept four amps). 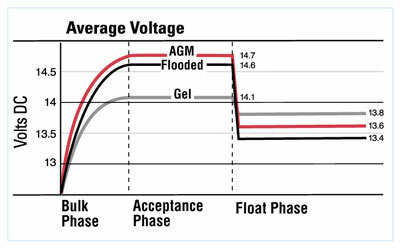 Float phase: When the battery’s acceptance declines to two to four percent of C, the voltage is reduced to 13.4 volts (Gel: 13.8 volts) to maintain the battery without losing electrolyte from the cells. This is a maintenance phase, not a charging phase. Equalization: This stage is used to prevent flooded lead acid batteries from aging prematurely, and is an optional, frequently omitted phase. After the battery reaches the end of the acceptance phase, the battery continues to be charged at four percent of C until the voltage stops rising, usually around 15.5 to 16.2 volts. This forces the battery to its highest possible state of charge, boiling the electrolyte in a controlled manner and dissolving the lead sulfate crystals that have collected on the battery’s plates. In industrial applications where maximum energy storage is important, this phase is done every charge cycle. 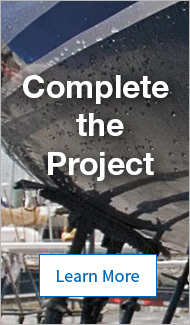 In the marine environment, it is more likely to be done every 20–50 cycles to extend the life and capacity of wet batteries. Gel and AGM batteries should not be equalized. Since electrical equipment and light bulbs can be damaged by high voltage, the battery should be disconnected from all loads during equalization. This type of battery charging, consisting of multiple stages, is not possible with automotive-type alternator regulators, unregulated solar panels, ferroresonant chargers, or taffrail generators. We strongly encourage the use of efficient charge devices, both for shorepower charging and alternator regulation, that use modern multiple-step regulation. Marinco ChargePro™ charger is great for a small boat. 12/24-volt charging, fully-potted waterproof (IP65) with 10A output. What size charger do I need? Deciding how big your charger needs to be is determined by the size and type of your batteries, and whether your boat has a continuous or intermittent source of AC power to run your charger. Boats that spend most of their week at a dock constantly hooked up to shore power require smaller chargers. You need enough capacity to run the continuous loads on your battery system, like DC refrigeration (frequently the biggest user of battery power) and lights, plus enough power to float-charge your batteries. A good rule is to have enough amperage to equal the sum of the DC loads plus 10 percent of the amp-hour capacity of the batteries. If you’re cruising or anchored out, and aren’t plugged in except intermittently, you will want enough capacity to recharge in the time you have available, if possible. You need enough juice to replace the power consumed by all the DC loads, as above, plus an average charge rate equaling the amp hours required divided by the hours available. Maximum amperage that batteries can accept during the Bulk Phase of the charging cycle vary depending on battery chemistry: flooded batteries can accept a charge rate of up to 25 percent of C; gel batteries have a higher acceptance rate of as much as 30 percent; AGM batteries accept the highest charging amps, as much as 40 percent of C.
If you operate your house bank between a 50 percent and 85 percent state of charge, as many experts recommend, and charge once daily, you should be able to return the 35 percent of battery capacity by operating a properly-sized alternator for slightly over an hour. More deeply discharged batteries, or smaller alternators, will require more time. Surprisingly, using a massive charger or monster alternator to pour on the current can be counterproductive, and can shorten your battery life. Excessive current makes batteries heat up and gas excessively (when the electrolyte dissociates into hydrogen and oxygen). Soon the voltage limit is reached, causing a downshift from the Bulk to Acceptance Phase. Adding more battery capacity is a better solution, and may even decrease the needed recharging time. Bigger battery banks can accept more charging amps, so they replenish more quickly and you don’t need to run your engine as long. 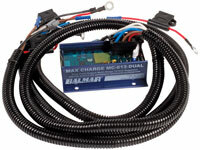 Max Charge MC-614-H has seven charging programs for your externally-regulated alternator. When it comes to efficient battery charging, a multi-stage smart shore power charger is only part of the story. You need a voltage regulator with intelligence, plus a high-output alternator, to maximize the efficiency of your charging system. In automotive applications, the alternator’s function is to keep a starting battery happy while supplying power to electrical/electronic systems needed to operate the car (for example, headlights, CD player, vanity mirror lights). 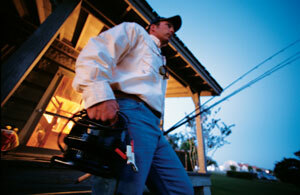 In this environment, a simple, internally-regulated alternator is usually more than sufficient to get the job done. Onboard a boat the alternator and regulator must support a much greater battery capacity to fulfill engine starting and house battery loads. The alternator and regulator must be able to charge effectively at lower rpms and live in an inhospitable environment. In addition, the alternator and regulator may sit for long periods between uses (surprisingly, one of the toughest aspects of alternator life). At the same time, this system must meet the expectations of boaters who want to have their batteries charged with the least amount of engine running time. Intelligent voltage regulation meets the needs of newer battery types, and the added load that modern electronics and inverter technology demand. Intelligent regulation matches the output of the alternator to the specific needs of your batteries (for example, AGM, gel, Optima, deep-cycle flooded) so batteries charge faster based on the needs of their unique constructions, and so the charging system can most effectively utilize the increased voltage high-output alternators provide. Max Charge and ARS-5 regulators are equipped with engineered programs for each battery type—just tell the regulator what battery type you are using and the regulator handles the rest. In addition, many smart voltage regulators are equipped with the ability to monitor both battery and alternator temperature, and respond by increasing or decreasing voltage levels to maximize both safety and performance. In the event of a condition that poses danger to the system or the vessel, the regulator has the ability to discontinue charging completely. Our 15 Amp Automatic Battery Charger with Engine Start Timer delivers three-stage charging for a flooded starting or deep-cycle battery. It even monitors how well your alternator is pumping out power. Shallow discharges lead to a longer battery life. 80 percent discharge is the maximum safe discharge. Don't leave batteries deeply discharged for any length of time. Charge batteries after each period of use. Don't mix old batteries with new ones. Undercharging: Consistently failing to fully recharge batteries leaves them with lead sulfate that hardens on their plates—they become sulfated—and gradually lose their ability to perform. Increased resistance when charging causes falsely elevated voltage readings, essentially fooling the battery charger, leading to further undercharging, in a downward spiral. Beyond a certain point, a sulfated battery cannot be returned to a healthy state, and you need a replacement. Keep your batteries charged, and equalize your wet cell batteries every six to eight weeks in temperate climates, and more frequently in the tropics. Overcharging: Especially fatal to Gel and AGM batteries, consistent overcharging (NOT equalization) boils the electrolyte out of the cells, and can even lead to thermal runaway, with the battery becoming hotter and hotter. One of our writers experienced thermal runaway on his liveaboard Catalina 30, caused by a ferroresonant “dumb” charger, with nearly catastrophic results. Excessive deep discharge: Don’t completely discharge a deep cycle battery if it can be avoided. The deeper the discharge the less life you will get from the battery. The ideal method is to charge and discharge the batteries through the middle range (50 percent to 85 percent) of their capacity and, if they are flooded batteries, to equalize them periodically. Leaving the battery in a fully-discharged state, for example during winter storage, causes it to become sulfated.